ONCEs, are you ready for TWICE to rock the stages in your respective countries? Popular girl group TWICE will kick off their “TWICE World Tour 2019” in Seoul on 25th May next month. The announcement of their 7th mini-album “FANCY YOU” was released prior to that of the upcoming world tour, which spells excitement for ONCEs who have been anticipating the girls’ comeback! 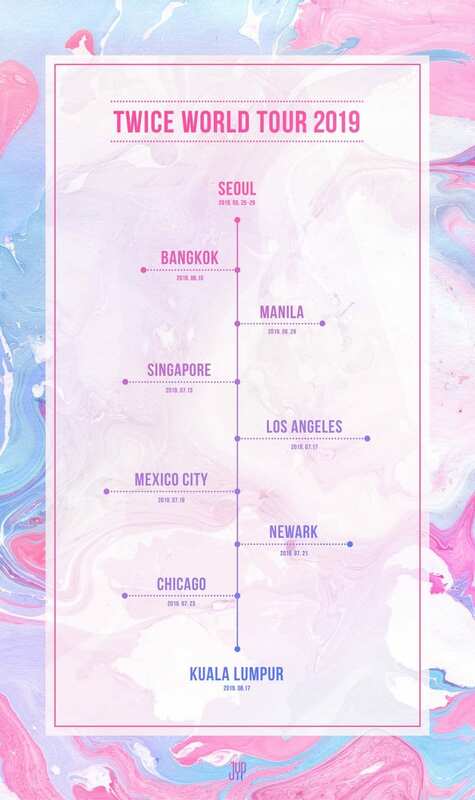 Consisting of members Nayeon, Jeongyeon, Momo, Sana, Jihyo, Mina, Dahyun, Chaeyoung, and Tzuyu, TWICE will be dropping by Manila, Singapore, and Kuala Lumpur on 29th June, 13th July and 17th August respectively to meet international fans! Known for their signature dance moves as seen in the “Cheer Up“, “TT” and “Signal” music videos, the girls will be coming back with more surprises for fans. If you want to see the girls performing to their upcoming comeback tracks in your country, don’t forget to mark your calendars for the official ticket launch!